Was it unfortunate timing or a spirit of competition that resulted in the near-simultaneous publication of Carcanet’s Selected Poems and Prose of Gottfried Benn, translated by David Paisey, and Impromptus, Michael Hofmann’s edition published by Faber and Faber? 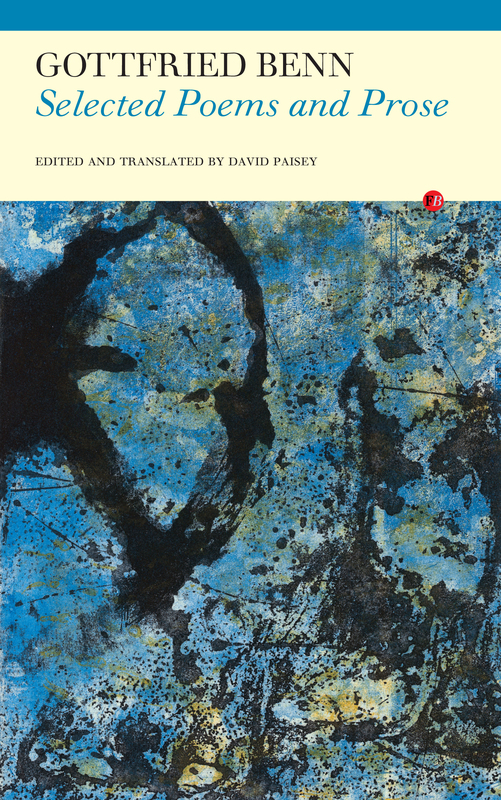 The coincidence may not have helped Paisey: after all, Hofmann set out his stall with The Faber Book of 20th Century German Poems (2005), which contained a number of his Benn translations, and more have been steadily appearing in Poetry, the TLS, and elsewhere – not to mention the fact of his eminence as an original poet, essayist, and translator of other German writers. Paisey, by comparison, comes out of nowhere. If their books are squaring up in a “Battle of the Benns,” Hofmann is surely the bookies’ favourite. Then again, Paisey’s edition also includes facing-page originals and a generous selection of Benn’s prose, which are missing from Hofmann’s Faber edition. (The American version of Impromptus, published by Farrar, Straus and Giroux, has prose and German originals). So the champ is fighting this round with one hand tied behind his back. A look at the contents pages of both editions reveals how the translators/editors weigh in. Hofmann has focused on Benn’s late work, mostly from the last decade of his life, as well as a selection from his early Expressionist poetry of the 1910s, including only eleven poems from nearly three decades between 1922 and 1949. Hofmann follows the final edition of Benn’s collected poems to be published in his lifetime in placing one of Benn’s last poems, ‘Can Be No Sorrow’ , first in the collection, lending a teleological design to what follows. Top and bottom, brains and feet: Hofmann’s Benn is thoughtful, nimble. Paisey’s, by contrast, is more of an all-rounder, with a better showing of Benn’s inter-war poetry, often in rhyme and metre which Paisey emulates in English. Perhaps, though, we should pause a second before enjoying this poetic showdown. After all, the business of translating involves a series of choices about how to render words and phrases buzzing with compacted meanings, only some of which may be conveyable in the target language. No single translation can render everything that’s happening in the source text; so rather than hailing one as the victor and tar-and-feathering the other, it would be wiser to appreciate their individual strengths and allow each to make up for the other’s weaknesses. If we triangulate these versions with the German as found in the Carcanet edition, we can see that Paisey’s is closer to being a literal translation, whereas Hofmann has allowed himself to drop the fifth line. Furthermore, Hofmann has chosen to amplify the poem’s sound-qualities, intensifying the alliteration and internal rhyming to create a more rugged texture. It is as if Hofmann has moved beyond rendering the German in English, to composing a new English poem charged with the Dionysian energy Benn projects onto the sculpted column. Paisey’s version feels, to the reader (like the present one) with little German, like a more reliable guide to what Benn wrote – but Hofmann’s is the more exciting poem. what is the English, pray, for: “Banane, yes, Banane / vie méditerranée?” “Banana, yes, banana / Mediterranean life?” I don’t think so. It is as though, having been done in one language (German? ), it can never be done again, in any other! This perhaps owes something to John Felstiner’s versions of Paul Celan, especially his ‘Deathfugue,’ which moves out of English back into the original German as the poem progresses. Likewise, Paisey re-translates Benn’s borrowed English “yes” into a German “ja,” then, leaving the second line in French, translates “vie Pol” into the French “vie polaire.” Although Hofmann initially appeared as the crowd-pleasing showman, here Paisey displays his own brand of bravura. The few of Benn’s rhyming, metrical poems Hofmann does translate come out in free verse with sporadic, apparently incidental rhymes; the effect of which is to blur the distinction between two very different kinds of Benn poem. In both poems, anti-Semitism exacerbates the dialectic of desire and revulsion. The likeness is so strong that one can only think that Eliot was fortunate to have lived in a culture where anti-Semitism wore a genteel aspect; had he studied in Marburg rather than Oxford and settled in Germany, he may not have conducted himself even as well as Benn, who satirized the Nazis in some privately-circulated verses during the War. Both translators deal with the issue of Benn’s connections with Nazism and the Jews in their introductions – an issue that can still enflame debate, as in the case of Martin Heidegger’s recently published ‘black notebooks’. Paisey’s introduction and selection of prose tends more towards a warts-and-all presentation of Benn’s failings, while Hofmann (because, I’m tempted to think, of the personal investment he concedes at the end of his introduction) seems more keen to exonerate them. Ideally, as I said, one would treat these two editions as complementary rather than pitting them against one another: each has different strengths, and a comparison of the two will shed light on Paisey and Hofmann’s decisions both as translators and editors. But the ordinary reader is likely to buy just one, and that will probably be the one she’s heard most about, and which is more widely available – which is to say, probably the Hofmann. Nonetheless (and especially given the availability of several Hofmann versions as well as his introductory essay online) the reader wanting to get to know Benn would do well to have a look at David Paisey’s. An online version of this poem can be found on Poetry Daily.